As I have mentioned, I recently completed my CanFitPro certification course to become a trainer. There were about 12 people in my class, split pretty equally of girls and guys of different ages and backgrounds and with different goals. Although, at first, I was a little intimated, everyone was very gracious and likeable and approachable, and I’ve been in contact with several of my classmates. But y’know, there’s always that one person….the person you connect with and who you feel comfortable with and who you think you’ve made a life-long friend in. I met Batman just prior to the class starting – most of us had to travel from different areas of the province and a few of us arrived early. Batman was sitting at a table with Robin and I asked if I could join them while we waited for the classroom to open. Over the course of this certification, Batman and I began chatting and have developed a friendship. And, although he is on the opposite side of the province, I have fallen just a teensy bit in love with him and his motivation, and he’s become my (super)hero. This guy and I have had many in-depth conversations and have recognized that we share very similar life events. Our pasts have been very different but our paths have been so much the same. So similar, in fact, that I continue to refer to us as the same person. Thankfully, his sense of humor is as warped as mine so he sort of gets it me. 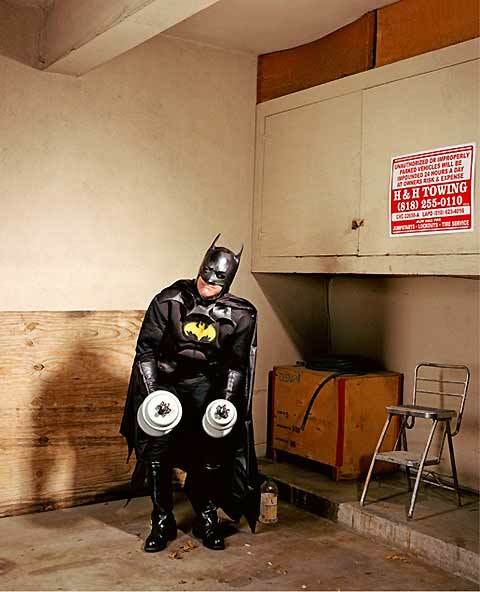 Batman has inspired me to do and become so much more in the gym; he is a big part of the reason I have decided to Step Outside My Comfort Zone and work on attaining new goals and try new equipment (that, and to rub it in his face that his gym does not have a Smith Machine). This dude has an incredible past and has accomplished so much and, although I haven’t known him for too long (or too well, for that matter), I feel like he’s just been in my life; like he is the best friend that I haven’t seen in years but we can pick up right where we left off. I feel incredibly comfortable with him, discussing my goals, my intimidations and fears, and the dark times that have made me stronger – because he’s been through similar. I gather so much inspiration and motivation from this guy – it’s a little ridiculous. I am proud to know him. So, it is with great excitement and pleasure that I announce that Batman has agreed to do an interview with me for a future post! I cannot wait for you all to meet him and get a little of the insight that he’s shared with me. I hope that he is able to inspire you the way that he’s inspired me. 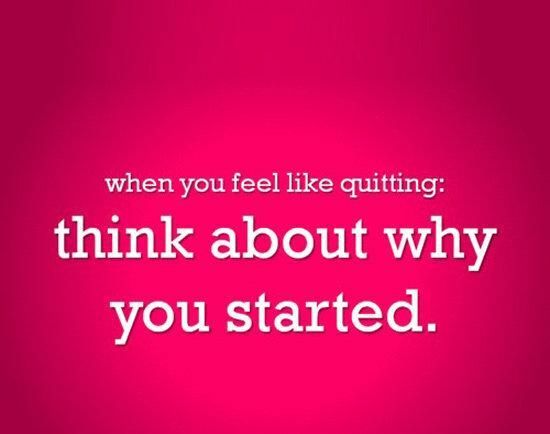 And, at the very least, that you can see that your goals are attainable as well. He is an incredible person; kind, brave, likeable, and dedicated to his fitness and I can’t wait to introduce him to you! I was born premature. I spent a lot of time in the hospital when I was young; too much time. I was a very sick little girl. I grew up with lung and breathing issues, which, in my older age, have not subsided. I am prone to pneumonia, bronchitis, asthma and other breathing difficulties that leave me panting and puffing like a 40 year smoker. When I was 16 I developed eating disorders. Lots of them. My eating disorders lasted for several years and I put my body through Hell. I disrespected it. When I was in high school it was discovered that I have a mild heart condition. I was told that I’d have a pacemaker by the time I was 30. I was afraid of everything and I hated my body. Then years ago I discovered running. And I fell in love. I get that runners’ high and it’s incredible. 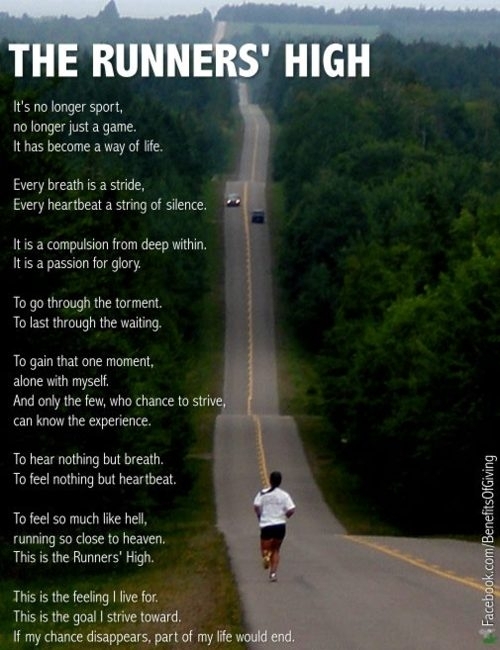 I used to run every day. I could not wait to get outside and run like the wind. But after surgery a year and a half ago I put running on hold. I was back in the gym but I could not bring myself to run. I just couldn’t get into it. Sure I ran here and there as I prepared to match my friend’s 10k, but I was running for the wrong reasons. And I resented it. A month ago I decided to run again. I realized just how much I’d missed it and now I’m running nearly every day. I crave it. AND, what I’m really impressed with is my stamina and my ability to not gasp and gag and pray for air. My breathing is better and my heart rate is steady and I’ve been able to run for longer distances than I ever had before. I feel incredible. I have only been able to take advantage of an outside run once so far this year so I’ve been running on an increased incline on the treadmill each day. That, along with my steady lung flow, makes me feel like I’m on top of the world. When I’m in my zone, I feel like I’ve accomplished so much – even if just personally. And I really have to thank Darius Rucker (aka Hootie) because his song Wagon Wheel has become my go-to running song (it’s great for keeping a pace, bolting when needed, and generally rockin’ out – don’t judge me). I am tipping my hat to myself and am hoping that I can will keep up with my running pattern and increasing my abilities – and I thoroughly look forward to getting back outside for my run, should the Nova Scotia weather choose to cooperate. Your true beauty comes from within, it is not based on the color of your eyes or how glossy your hair is or how big your biceps are. 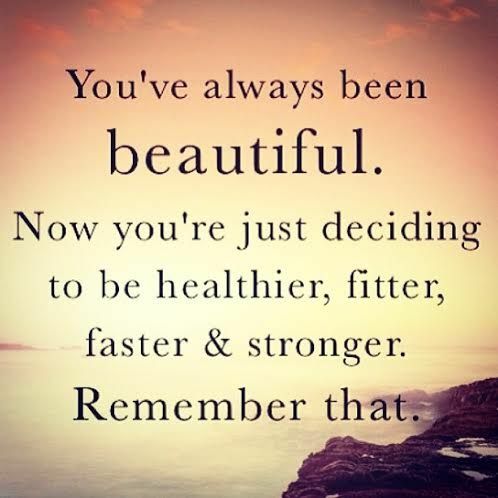 Your beauty comes from your soul; from your willingness to treat everyone as an equal, to be a friend to all, to love from the depths of your heart, and mostly, to respect and embrace yourself as you are. Once you show yourself the love (by exercising your body and feeding and watering it properly, by exercising and enlightening your mind with knowledge, by loving and sharing your soul), everything else in life can become beautiful too. I finished my CanFitPro certification course this past weekend. Whoo hoo! It was an overwhelming couple of weeks with tons and tons of information to take in (bioenergetics, biomechanics, etc.) and I have tons and tons of studying and prepping to do before I complete my exams. Thankfully I have about 5 weeks before the written exam and then from there I have to schedule the practical. Fortunately, I had a friend who’s taken the course and is already training (she’s the person responsible for me going for this!) so I’m able to shadow with her and ask questions. And my gym and class buddy has “volunteered” to be my guinea pig so I’m able to work with her the way I would work with a true life client. And it’s helping. This past weekend, during the course, we spent a good amount of time in the gym and getting to know new equipment. I’ve always been intimidated by some of the equipment in my gym but since I got back from the course I’ve been broadening my horizons and it’s empowering. One of the big attractions in the course gym, that all the guys and gals were going gaga for, was the Smith Machine. And guess what? We have one of those at my gym! I was so excited to brag about this piece of equipment and get back to my gym to really work with it (I’d tried it once or twice before; it’s still very new to my gym) and I love it. I’ve been increasing my weights over the last year but this machine I think will really help me build my upper body strength – especially since I’m still dealing with this stupid back injury, this machine should be great in keeping me from preventing more injury (let’s all knock on wood just in case). 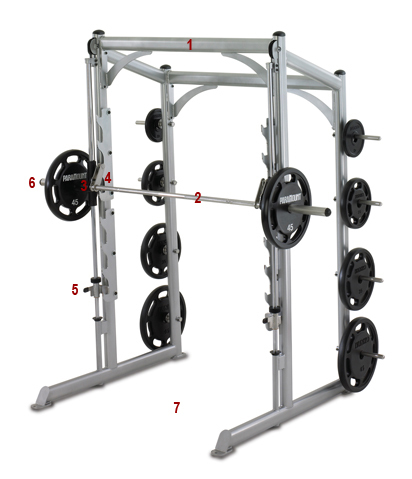 If you’re not familiar with the Smith Machine you can check out the Wikipedia page here and the photo below. The really great thing about the Smith Machine is that it has these little jagged teeth where you can sit or rest the weights on AND where you can lock the safety on each side so if you’re doing lifts and lose your balance the weights will only fall to the safety. Or, if you drop the bar completely, it falls right into the next set of teeth. I am really looking forward to getting more use out of this piece of equipment. I’ve also started using other pieces more and plan to continue with them. If you are like me and don’t feel great outside out of your comfort zone, try taking tiny steps and take full advantage of new equipment (or equipment new to you). It’ll be worth it in the end. I mean honestly, if wishes came true I’d be taller, thinner, richer and younger. But because I work for it I feel taller, thinner, younger and richer in life. You can too. Feel proud of your accomplishments. Deserve them! Anyone can wish. Only some of us will work for the results. Sorry Friends – it’s already been a long week and it’s only Tuesday but I wanted to leave a little food for thought. My CanFitPro certification course starts later today and I am stoked. I don’t even know what to say. I keep typing things and then deleting them because it just doesn’t make any sense. I woke up extra early this morning and couldn’t get back to sleep – you’d think it was Christmas for goodness sakes. So I got out of bed, finished packing (the course is not offered in my town) and started my morning off with a delicious AND HEALTHY Chocolate Avocado Smoothie (click HERE for recipe) – which is slowly becoming my new addiction. 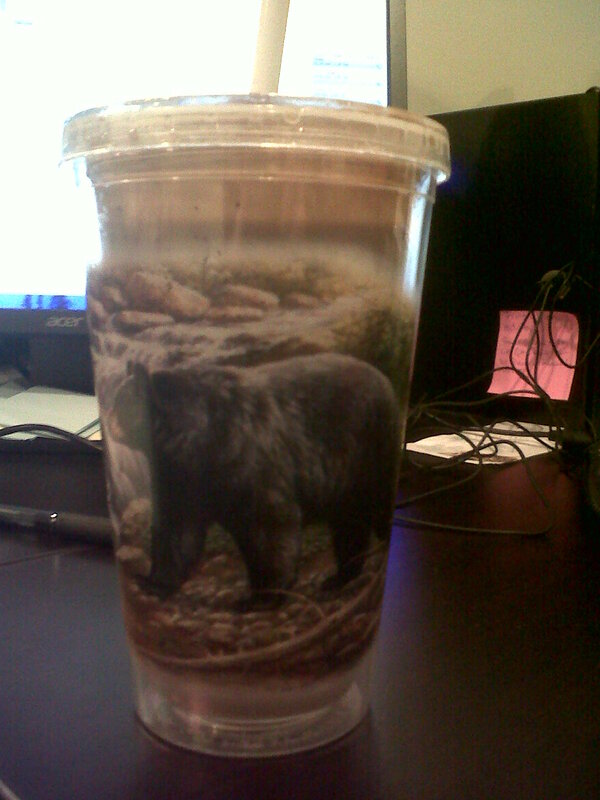 Started my day with a delish smoothie in my awesome bear cup. Honestly, I’m excited and nervous. Once today is over with I’m sure my nerves will calm a bit. Day 2 will be smooth sailing. Anyway, I am counting down the clock ’til I can bolt from work early and get on the highway to a dream. Wish me luck?